Access Database Synchronizer Microsoft SQL Server 2005 Everywhere Edition Access Database Synchronizer provides a way to synchronize data between a Microsoft Access database on a desktop and a Microsoft SQL Server 2005 Everywhere Edition database on a device. I have today uploaded v2.0 of this free sample Access 2007 database that gets you beyond the frustrations of the new Office Ribbon, and in v2.0, helps you learn the location of familiar commands in the unfamiliar Ribbon environment. In version 2, I have added the full Classic MenuBar to the Ribbon Add-Ins tab. The Menubar is context-sensitive and button-clicks on commands in the Menubar as well as functioning in the normal way, also operate on the Ribbon to display the relevant Ribbon tab. Download the Sample ACCDB file and import the two forms and one module into your Access 2007 ACCDB, after checking the Menus and Toolbars checkbox in the Import Objects dialog. Custom Task Panes in Visual Studio Tools for Office "v3" June CTP Create an add-in for Excel 2007 and then customize the application-level custom task pane. Generating Office Documents using the New XML Open File Formats Generate, read and modify documents without going through the object model of the hosting Office application. Extending the Office 2007 User Interface with a Custom Task Pane Create a shared add-in with Visual Studio 2005 that extends the new user interface with a custom task pane. Customizing the Ribbon with Visual Studio Tools for Office "v3" June CTP Create an add-in for PowerPoint 2007 to customize and modify the ribbon. Creating Custom Workflows with the SharePoint Designer 2007 Build a custom workflow using the wizard provided by SharePoint Designer 2007. Creating and Using Event Handlers in Windows SharePoint Services V3 Create a list item receiver class to handle both synchronous events as well as asynchronous events. Creating and Testing Features with Windows SharePoint Services 3.0 Step through the process of using Visual Studio to create a custom feature and an associated assembly DLL. Creating and Customizing Site Pages with SharePoint Designer 2007 Understand the difference between page templates and page instances and then learn how to customize your pages. Extending the Office 2007 User Interface with a Custom Ribbon Create a shared add-in with Visual Studio 2005 that extends the new user interface with a custom ribbon. Creating and Customizing Document Information Panels with InfoPath 2007 Discover the integration that exists between Document Information Panels and content types in Windows SharePoint Services V3. Visual Studio 2005 Team Edition for Database Professionals CTP 5 - Beta Tools for building SQL databases in a managed project environment with support for versioning, deployment, unit testing, refactoring, and off-line SQL development. 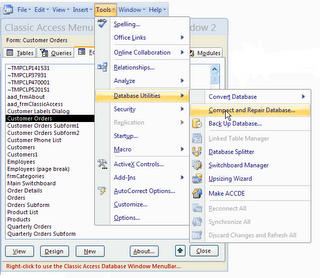 You can use Access 2003 or earlier to create custom command bars and menus in MDB files and those can be used in [Access 2007] add-ins. If you want to use an ACCDB format add-in or if you don't want to use Access 2003's visual designer for command bars and menus, you will have to create them programmatically. The add-ins command bars will appear on a separate add-ins tab in the Ribbon. If you want to have a custom ribbon instead of using the old style command bars, you will probably have to develop either a COM add-in or a managed add-in. There is [aad: "a bit of "] documentation on building add-ins for the ribbon. You can find some of that documentation here: http://msdn.microsoft.com/office/tool/addin/. That said, ribbon add-ins and Access menu add-ins don't work all that well together. This ISV would probably want to convert their Access menu add-in into a managed add-in or a COM add-in if they want to use the ribbon. Microsoft SQL Server 2005 JDBC Driver 1.1 Download the Microsoft SQL Server 2005 JDBC Driver 1.1, a Type 4 JDBC driver that provides database connectivity through the standard JDBC application program interfaces (APIs) available in J2EE (Java2 Enterprise Edition). SQL Server 2005 Failover Clustering White Paper Comprehensive document about implementing failover clustering for SQL Server 2005 and Analysis Services. This article from TechRepublic.com provides a step-by-step guide on adding a Pivot Chart to an MS Access report. A good article from Susan Sales Harkins of TechRepublic.com on a fast no-frills way of returning a row of summary values using UNION. Normally, you use SQL’s UNION operator to combine data from two or more tables or queries, but you can also use it to display detail records and summaryvalues. 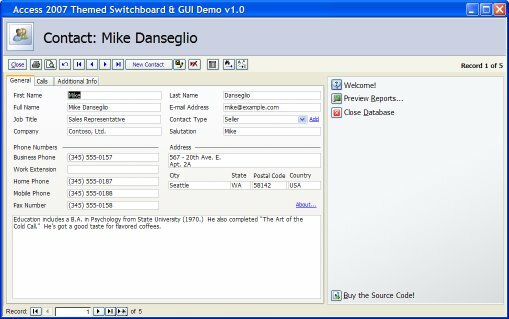 Replaces the native Access Switchboard with a superior switchboard, navigation paradigm, and GUI. Uses the Switchboard Items table created by the native access Switchboard Manager. Built-in support for up to 16 option buttons for each switchboard! Option Button Icons are assigned on the fly from a value stored in the Switchboard Items table. The Switchboard resides in a subform, so that the main screen is not affected when switching switchboards. FLASH: Windows Vista Will NOT Support MSDE or SQL Server 2000. Windows Vista/Server will support only SQL Server 2005 Service Pack 2 and later. SP2 is due to ship soon after Vista to ensure compatibility. There will be no support for the Microsoft Desktop Engine (MSDE), the SQL Server subset, used by many Access developers, shipped with Ms Access/Office prior to Version 2003, and mean't to be replaced by SQL Server Express. Word 2007 HTML and CSS Rendering Capabilities in Outlook 2007 (Part 1 of 2) Provides reference documentation related to supported and unsupported HTML elements, attributes, and CSS properties. Word 2007 HTML and CSS Rendering Capabilities in Outlook 2007 (Part 2 of 2) Provides detailed instructions on how-to install and use the Outlook 2007 Tool: HTML and CSS Validator. Outlook 2007 HTML. Video: Customizing the Ribbon with Visual Studio Tools for Office "v3" June CTP Create an add-in for PowerPoint 2007 to customize and modify the ribbon. Video: Extending the Office 2007 User Interface with a Custom Task Pane Create a shared add-in with Visual Studio 2005 that extends the new user interface with a custom task pane. Video: Generating Office Documents using the New XML Open File Formats Generate, read and modify documents without going through the object model of the hosting Office application. This download provides a CHM version of the Business Contact Manager for MS Outlook 2007 Developer Guide. A free book chapter download from Techrepublic.com. Windows SharePoint Services Applications Template: All Templates This MS download contains all downloadable application templates for Microsoft Windows SharePoint Services. Learn about the scenarios and XML mark-up that you can use to customize the Ribbon user interface (UI) in the 2007 Microsoft Office release. 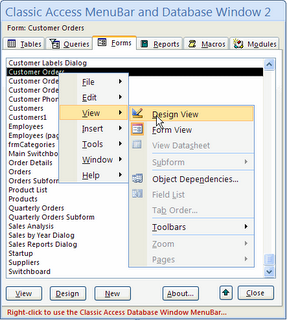 The Ribbon UI replaces menus, toolbars, and most of the task pane UI in the 2007 release.